While tasks and deadlines are handled by lawyers and staff working on individual files, firm systems and processes are critical to ensuring deadlines are not missed and that files are kept moving. The changed deadlines and processes under the new Rule 48.14 introduce new claims risks that may trap the unwary lawyer. Please keep in mind the most significant change: courts are now automatically dismissing actions not set down for trial five years after commencement, without sending notices of any type to parties or their lawyers. Tickler systems play an essential role in making sure deadlines are not missed and that files are being moved along. LAWPRO’s Rule 48.14 Firm Transition Checklist (PDF) will help you make sure your firm’s processes and tickler systems are updated to reflect the new Rule 48.14. Individual File Checklist: Use this checklist to determine the dismissal deadline under the new rule and that all relevant tickler systems are updated. File Progress Plan Precedent: Use a file progress plan to assign tasks and track how work on a file is proceeding. 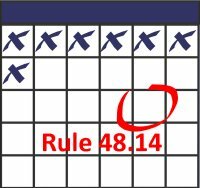 Rule 48.14 Transition Training PowerPoint: Use this PowerPoint presentation, which includes detailed speaking notes, to train lawyers and staff on best practices to prevent a Rule 48.14 dismissal.